Play for free Extra Chilli Slots by Big Time Gaming and win some spicy real money bonuses! What a life without any spice in it? Big Time Gaming also understands that spice should be the way of life. Hence, BTG has brought forth another slots machine for the real money customers. Its called Extra Chilli Slots having 6 reels and no fixed rows as such. And guess what? Real money players get to win in 117649 different ways or we can say, MegaWays™. Spin the reels of this hottest and chilliest slots game and you can get up to 24 Free Spins, unlimited winning multipliers etc. Big Time Gaming earlier treated gamblers across the world with money yielding slots like Bonanza, White Rabbit and many more. The provider has a habit of stunning everybody around with its games, like in November last year, they released 'Who Wants to be a Millionaire' slots game. So, with Big Time, you're never losing instead you're winning every step of the way and Extra Chilli Slots game is a clear example of that. Our review given below unfolds all the significant details about Extra Chilli's RTP, Bonus Rounds such as Win Multipliers, Feature Drop etc. Take your pick between free play and real money play and add some spicy flavors to your life. How to play Extra Chilli Slots Game? Stake Value: From the 'Stake' button given on the right hand side, the real money players can choose their stake value. The minimum stake a player can place is $0.20 and the maximum stake value that can be placed is $40. Feature Drop: Players can also choose to buy the feature for the amount displayed above the 'Buy' button. At zero balance, this feature triggers automatically. Autoplay: Just below the stake button is a blue – colored toggle. Clicking on it will present the player with four options – 'Pays', 'Auto', 'Options' and 'Help'. From 'Auto' button, players can select Auto Spins up to 100. Advanced settings are also available to customize the game play. Spin button: At the bottom right corner of the slots screen, there is a play/pause button which is the spin button. Hit it and the reels will start spinning in no time. As soon the reels stop spinning, the result will be displayed. Player's payout will be multiplied by the selected stake value of every single spin. Total Balance: Real money players can win free spins, multiply their winnings with the multiplier feature etc. All the winnings will get added and be displayed on the top of the slots screen in the 'Balance' section whereas single spin wins will be displayed in the 'Win' section. Winnings shall be awarded only on adjacent symbols placed from left to right irrespective of the bet size. Payouts shall be multiplied by the stake placed and highest win shall be paid per winning combination. All the winning combinations shall be added together. Every reel alone or along with the extra reel shall have up to 7 symbols only and one spin can have up to 117649 Megaways to win. Game played without buying 'Feature Drop' shall have an RTP between 96.15% to 96.41%. A game round where a player buys 'Feature Drop' shall have an RTP between 96.26% to 96.82%. Any incomplete game shall become null and void after 90 days and the winning amount from that game shall get forfeited to charity. Any system malfunction shall void all pays and plays. The Big Time Gaming powered slots machine, Extra Chilli is brilliantly designed and stands true to its name. With a backdrop of Mexican fruits and vegetables market, the game has the 18th century music, Mariachi playing in the background while the player spins the reels. The food market is set in broad daylight and it only grows dark when a bonus feature is triggered. Also, the slots screen is bordered with bundles of yellow, red, green chillies and garlic as well. So, for the real money players, not only there are 117649 Megaways to win but the chilli pepper view in the background also stands out. Scatter Symbol: Three alphabets 'H', 'O' and 'T' embedded in golden square shaped icons are the scatter symbols in this slots game. Getting 3 'HOT' scatters will win you 8 free spins and extra scatters will add 4 extra free spins. Wild Symbol: Wild symbol is represented by the rocket launcher with three fireworks. This symbol will substitute for every symbol except Scatter and they will be present only in the extra reel. Standard Reel Symbols: There are 10 standard reel symbols and out of these 10, only four are high paying symbols and other six are low paying symbols. The High Paying Symbols are – Purple Chilli, Red Chilli, Blue Chilli and Green Chilli. The Low Paying Symbols are A, K, Q, J, 10 and 9. Extra Chilli slots game is powered by one of the most innovative software company, Big Time Gaming. BTG was founded in the year 2011 and has since then worked extensively to provide high quality slots and table games to all the leading online casinos in today's gambling world such as Ladbrokes Casino, Pokerstars Casino etc. Big Time Gaming launched a videoslots game called Bonanza with the Megaways feature where players can have 117649 different ways to win on a single spin. In this slots game, an extra reel can appear adding one more symbol to the reel it is below for 2, 3, 4 and 5 reels. Every winning symbol will be a part of a reaction which implies that each of the winning symbol(s) will disappear and replace with some other symbol coming from the top of the reels and also from the right in the extra reel. The replaced symbols will generate more winnings. During the free spins round, an unlimited winning multiplier will start. This win multiplier will start at 1 and it'll keep on increasing by 1 after every reaction. The free spins scatter symbol icon appearing in the extra reel during the free spins round will fetch the player some extra free spins. Getting 3 scatters will trigger 4 extra free spins while 4 scatters will trigger 8 extra free spins. After the feature is triggered, the 'Free Spins Gamble Wheel' will appear offering up to 24 free spins. Players will be asked to 'Collect' or 'Gamble'. Click on 'Collect' to start the free spins round with the current number of Free Spins awarded. Clicking on 'Gamble' will spin the wheel and a successful gamble will fetch the player 4 extra free spins plus a chance to play yet another Free Spins Gamble. On the other hand, an unsuccessful gamble will yield the player the number of free spins as are displayed in black color. If this number is zero, the feature will automatically conclude. Everytime a player gets matching consecutive symbols across the reels, a win is triggered starting from the leftmost reel and going towards the rightmost reel. Only the highest win will be paid per winning combination and all the wins generated from the winning combinations will be added to calculate the total winning amount. This Bonus feature can be seen on the right hand side of the slots screen. Real money players can click on 'Buy' button in order to buy this feature at any time. 'Feature Drop' can be bought for the price displayed above the 'Buy' button. In case the price displayed drops to zero, the feature will trigger automatically. Summarizing this slots review, we can say that no one delivers the best Megaways triggering game except for Big Time Gaming. 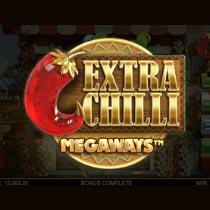 They are back with Extra Chilli Slots game to add the spice that was missing from quite some time. This online slots machine was released just last year and has gained much popularity in a short span of time. Tune in your gaming mode and get a spicy winning amount made out of a whole lot of free spins, multiplier bonuses and a bright sunny day in the background making things fall in place. A free demo mode will let you learn the recipe to cook a chilly winning amount for yourself during the real money play mode. Please enter your review for the Extra Chilli Slot.